If everyone at Solarity had a second job title, because my previous position was as a Help Desk Manger, mine would probably be “the tech guy.” I appreciate technology and I’ve often been an early adopter, so it made sense that when we implemented Microsoft Teams here at Solarity, I’d take the lead. Microsoft Teams is a hub for managing chat, meetings, notes and documents across groups of people. It’s basically a group chat software with added functionality for the workplace. The goal of Microsoft Teams is to integrate the people, content and tools your team needs to be more engaged and effective. Teams is free with Office 365. At Solarity we had a few different reasons for adopting Teams internally. First, as a project management firm, teamwork is as integral to what we do as great food is to a family dinner. 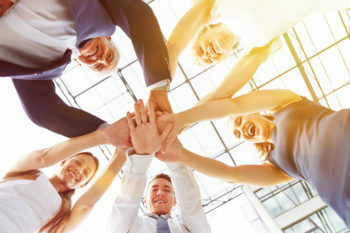 Literally everything we do involves groups of people communicating with each other and working together to take a large, complicated process from start to finish to reach a goal. Teams seemed like (and is!) a great resource. Secondly, we have clients who are asking us about it. Since Teams is available free to any business or individual with Office 365 (and you can still invite people who are on Google or other non-Microsoft platforms), our clients have considered dipping their toes into Teams and are asking for our advice. Thirdly, clients who have decided they want to give Teams a try are looking at this powerful tool and want us to consult with them on how to roll it out effectively within their organization. Now that I’ve been in conversations and projects working with Microsoft Teams for about a year, here’s my advice– Teams can be an effective asset to a company, and if you are interested in it, you should definitely take a look. It allows members of staff to stay better connected, whether they are in the office or not. It doesn’t undercut who you are as a company. In fact, it can be a great conduit for expanding company culture. Here at Solarity, one of the tools I have tailored for our roll-out was a Day in the Digital Life with Microsoft Teams – Making change a practical reality @ Solarity. We wanted each employee to be empowered to adopt Microsoft Teams in a way that best fit their work style, so we shared common scenarios to help them see how they could build Teams into their regular workflow. Use Outlook to connect to a meeting from your email or calendar. Sometimes it’s as simple as checking Teams every time you would normally check Outlook or your email. As more people use it more often, it becomes the norm. Eventually, everyone comes to depend on the connectivity and functionality Teams offers. And next thing you know, the company holiday party invite is coming via . . . you guessed it. Teams chat. As the resident tech guy, I can’t help but be excited about our implementation of Microsoft Teams here at Solarity. Because Teams is this dynamic, organic, rapidly-evolving creature, I feel a kind of camaraderie with everyone else out there who is also learning and growing with it. And because of the connectivity aspect, I can even reach out to others who are in the same position and learn from them. Questions about security settings? Let’s see what others have figured out. Remember user groups? Teams takes user groups to a whole new level, and information can be shared in a much timelier manner. Teams is a place where our community can come together and embrace letting technology take us to entirely new places. In a climate of division we have something bringing us together.